Jon Cannings is a returning road and track racer, and Emma-Kate Lidbury is one of the country’s top triathletes. They are both sponsored by Wiggle, the mail order company that supports several riders across a number of disciplines, and in 2010 will sponsor the Wiggle Super Series of 10 road and four off-road cyclo-sportive events running throughout the year. The first Wiggle road event will be the New Forest Spring Sportive, which will be held on April 18. It starts in the charming village of Brockenhurst, right in the heart of the National Park, which is where we meet the series promoter, Martin Barden of UK Cycling Events, along with Cannings and Lidbury, who are doing a course recce. Barden is particularly excited by this event, as he grew up close to the New Forest and has done a lot of cycling here. “With speed limits of 20-40mph, good road surfaces, really nice scenery and often good weather, there can’t be a pleasanter place in the country to hold a sportive, and to cycle in general,” he points out. It’s true, even the weather agrees today, which is a nice surprise at the end of an icy winter and a difficult one for cyclists all over the country. It is worth noting, as we follow Cannings and Lidbury, that the New Forest roads have hardly been touched by the tarmac-shattering ice that has wrecked some pretty stretches elsewhere in the country. The New Forest Sportive has two routes, a 56-mile and an 83-mile loop, both of which go north from Brockenhurst then east over rolling forest and heath roads. The route then heads south, hitting a very stiff hill first, and on down the Avon valley before a more exposed eastern leg back towards Brockenhurst. The shorter route then heads straight back to the start, and the 86-miler does an extra loop along the coast, east of Lymington. Barden is expecting a good turnout for the New Forest and for the whole series, which has some imaginative names like the Jurassic Classic, and really spectacular routes. 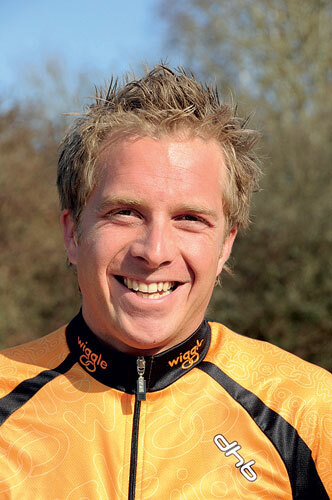 He is passionate about the whole sportive movement in cycling. “When I was young my family were into sailing, which is a really family friendly sport. When we all went away at weekends there would be something for everyone to do,” he says. Today’s route cuts out the most northerly bit of the sportive and the Lymington loop from the longer route, but when we stop to take some pictures in the dappled light of the forest’s Ornamental Drive, I find that the ride gets Cannings and Lidbury’s approval. Cannings has just moved to this area after getting a job in buying for Wiggle. He’s been away from racing for a while, but is eager to get back. “I stopped racing because I got a job as a guide with Club La Santa on Lanzarote. A lot of people train there but there’s no racing, except for triathlons,” he says. He was the TLI under-23 British champion and has raced in Belgium. “I loved that, it was a great experience, but you soon know where you stand as a cyclist, so being a guide and now working in the industry is how I can pursue a career in cycling. But now I’m settled, I thought I’d start racing again to see how it goes,” he explains. Cycling was something that Cannings discovered as a teenager in Bristol but Emma-Kate Lidbury found her way into triathlon when she was 25, and entirely by accident. 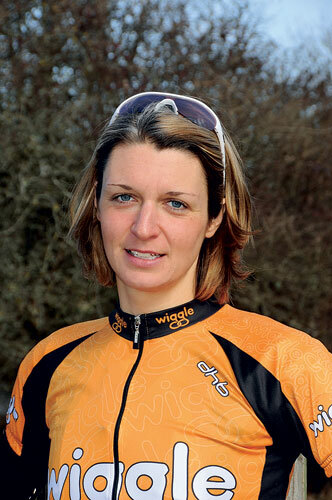 Lidbury won the European title for her age group in 2008 and is now a full-time triathlete, although she still writes about triathlon and fitness for magazines. She’s also become a quite committed cyclist. “I love the synergy of triathlon, putting the three disciplines together on race day, but surprisingly because I had no background in it at all, cycling has become my strength,” she says. Lidbury intends to use her cycling strength to concentrate on 70.3 races this year, or half-Ironmans as they are sometimes known. Strangely, although they are longer than Olympic distance, Lidbury reckons that 70.3 and Ironman events suit strong cyclists more than other triathlons because the bike makes up a larger proportion of them. “Cyclists certainly have the aerobic fitness for triathlons and the leg strength. They just need to do some running to get their legs used to it and take some swimming technique lessons. The engine is there already,” she points out. This route is nothing if not varied. The northern leg is all forest, heath and gently rolling, but the southern leg starts with a shock, a 25 per cent hill in Blissford. And, as we get there, “suicide donkeys,” Barden notes. 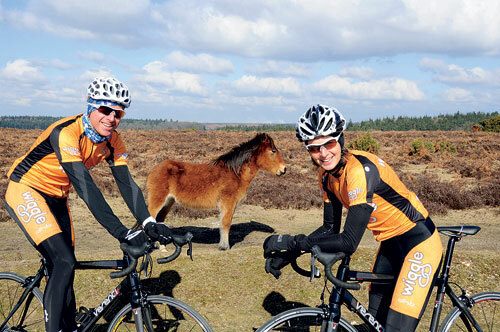 Animals rather than cars are the hazard to cyclists in the New Forest, and as Cannings and Lidbury descend to start the big hill one or two mean-looking ponies leave it late to clear the road. “They can be unpredictable,” Barden says. The River Avon stretch passes easily, although floods have recently washed up a bit of gravel onto the road. “It’ll be OK on the day as we sweep the parts of the course where we know there’s a problem,” Barden says. Then in Bransgore the riders turns back towards Brockenhurst, and it’s tough going on exposed terrain into a keen easterly wind. At the end though, Cannings and Lidbury have enjoyed the ride. Barden is all smiles too. “Cycling is going through such a period of growth at the moment, and sportives fit so well into people’s lifestyles,” he says. Start in Brockenhurst and head north on the unclassified road that leads into the forest along Ornamental Drive. The redwoods and Douglas firs on either side it were planted around 1860. The forest section continues north of the A35 then changes to a mix of heath and forest. The heath sections are where a lot of ponies hang out. Turn left on the B3078 and follow to Godshill, where turn left to Blissford and the roller-coaster 25 per cent hill. Continue on the unclassified road south along the edge of the Avon flood plain, through Ringwood, where the leisure centre featured in the outdoor shots of BBC’s The Brittas Empire, and on to Bransgore. Turn left to Burley and right to Brockenhurst, taking care crossing the A35.